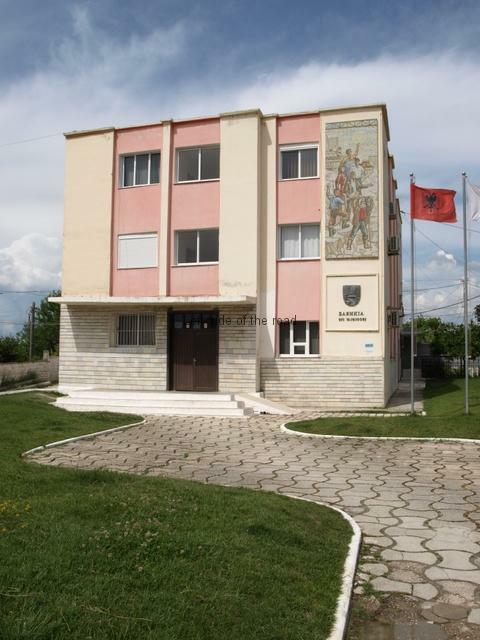 Many of the lapidars in different parts of Albania have suffered from vandalism and neglect. 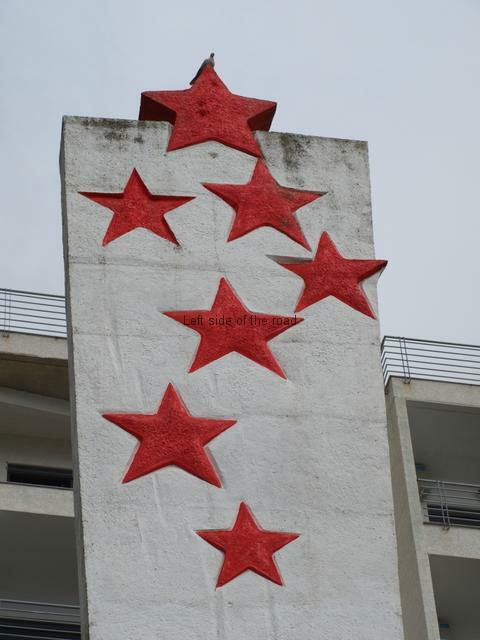 This is sad as it is displays a lack of respect of the Albanians for their heritage. Those with a particular Socialist message have suffered the most, attacked by the monarcho-fascists when the country was going through a period of anarchy in the late 1990s. Caught up in this denial of the past are also some of the monuments dedicated to the country’s ancient ‘national hero’, Skenderbreu, and a bas-relief called ‘Skenderbeu’s Wars’ the ‘stone city’ of Gjirokaster has likewise being ignored and allowed to fall into decline. The monument is located just above the old town, where the road starts to zigzag as it heads up to the entrance of the castle. This is the north facing side of the hill and is covered with trees and bushes which, in the heat of summer, make for one of the most pleasant locations in the city to cool down. 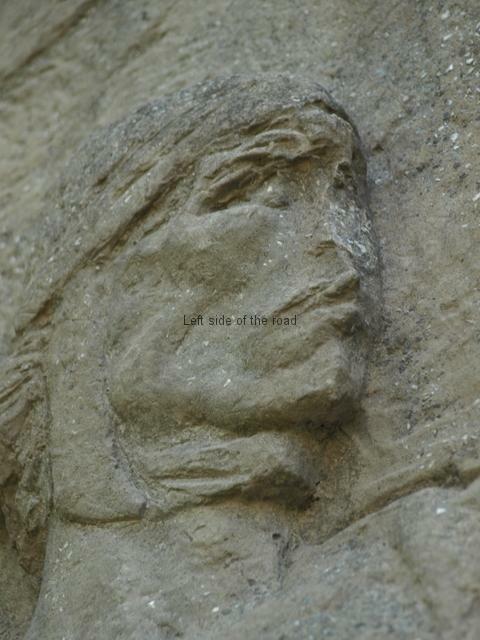 However, this is not the best kind of climate for the bas relief created by Hector Dule in 1968. In Albanian it’s official title is ‘Lapidar kushtuar luftrave të Skënderbeut’ which translates as: ‘Monolith dedicated to Skenderbeu’s Wars’. I’m sure that during the period of Socialism the area would have been kept clear but over the last 25 years or so the trees have been allowed to grow and if you didn’t know what you were looking for would easily miss whilst passing only a few metres away. 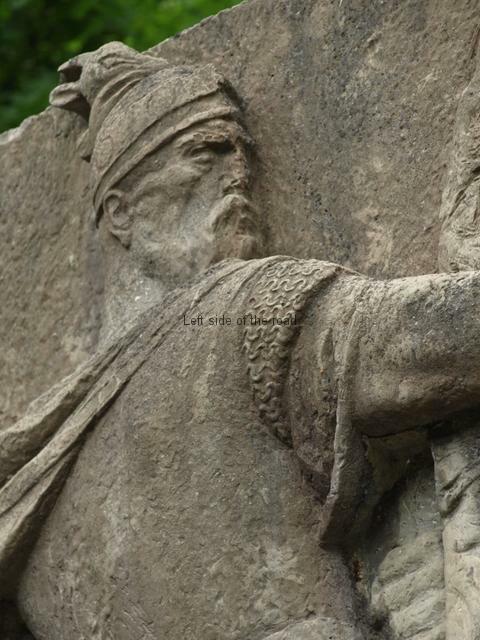 The monument consists of two parts – a concrete panel with images from the time of the Skenderbreu wars and a black stone column about twice the height of the panel to which it is attached. The construction of the bas-relief is different from all the others I seen so far in that the constituent parts were obviously created elsewhere and then brought to the site to be put together. There are 4 square sections (on the left) and a larger, rectangular section on the right. Most later lapidars of similar materials appear to have been created on site. This was perhaps made possible as expertise and the technology improved as this depiction of Skenderbreu is one of the earliest of the sculptural lapidars. This is not to say that Albanian lapidars didn’t exist before 1968. 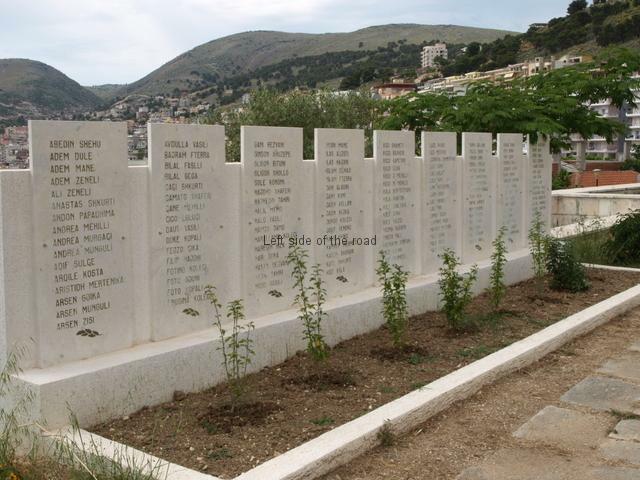 As the article ‘About the film ‘Lapidari” in Vol 1 of the Albanian Lapidar Survey points out the first lapidars appeared as soon as the National Liberation War had ended – if not before with the placing of simple grave markers over the bodies of some of the fallen Partisans. 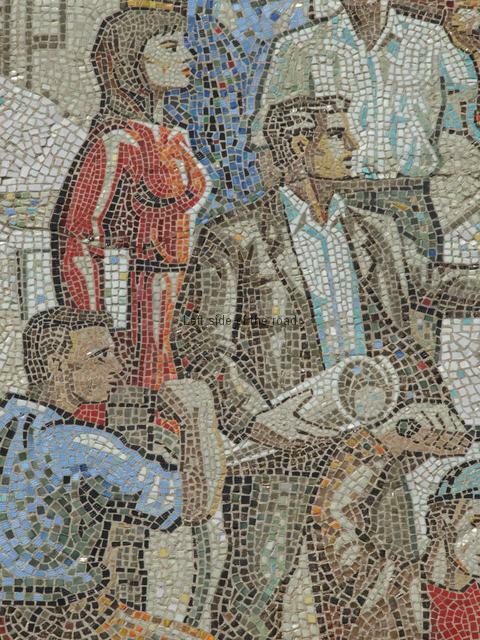 However, it was not until the mid-1960s that the Party of Labour of Albania decided that these locations would be an ideal place to develop both Socialist Realist Art as well as create an educational and propaganda tool for the promotion of the Socialist ideal – this was the start of Albania’s Cultural Revolution. 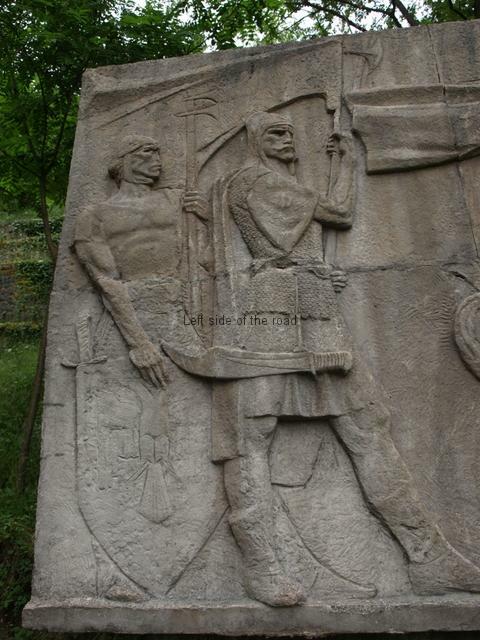 There are three males depicted, Skenderbreu himself and two of his followers. 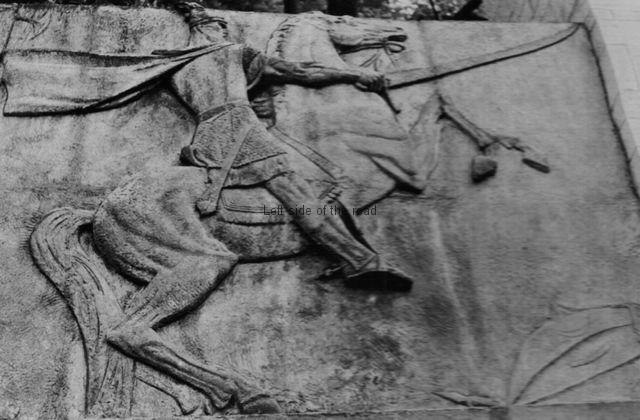 Skenderbreu is seated on a rearing horse and takes up more than two thirds of the space whilst the two soldiers stand behind him on the left hand side of the panel. 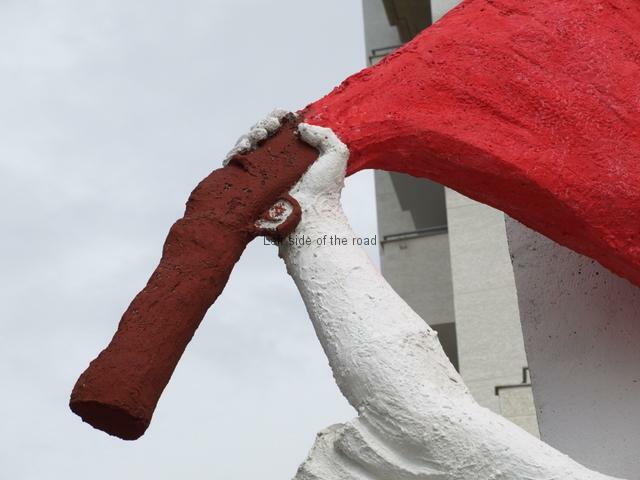 Here it’s worth well mentioning that the image that all Albanians have of Skenderbreu is one very much created in the mid 20th century by the sculptor Odhise Paskali who created the first sculpture of him in 1939, a head and shoulders bust. From then on that was the image and look that has been perpetuated by all subsequent artists. This ‘created’ image was as a result of the fact that no images exist of Skenderbreu as a fighting man, the only ones I’ve seen are of him when he was well past his fighting days. So here we have another situation where reality has been sacrificed for visual effect. Although a fan of Dule’s work I’m not a fan of this particular piece. The image of the female Communist over the entrance to the main hall of the Palace of Congresses, for example, is a stunning piece of work but here the image is let down by how he has portrayed the horse – it’s a really ugly horse for a steed that would charge into war. Such horses had be be even more fearless than their riders as they weren’t able to rationalise the environment into which they were forced to go. But this horse looks thin, weak and afraid. Its hind quarters, especially, appear as if the hide had been removed and is reminiscent of some of Michelangelo’s sketches of the muscles and ligaments of living creatures he produced 500 years ago. The horse is reared up on its hind legs, front hoofs pawing the air as if it were just at the point of beginning a charge but it doesn’t look too happy about it. To me the proportions of the head are wrong, it looks to small and gaunt for what, at that time, was the version of a tank. The size and speed of the horse was as much a weapon as the rider with whatever vicious cutting instrument he was carrying. The other thing that’s strange about this horse is that he has an incredibly, ridiculously even, long tail, trailing on the ground as it rears up. His face is in semi-profile. Dule has him looking slightly to his right, and it’s possible to see the features of the determined face, covered in the obligatory bushy moustache and beard of the time. He is well protected for the period, wearing a chain mail shirt over which he appears to have the top half of a suit of armour. Around his waist can be seen a short skirt of chain mail so this is probably a chain mail doublet. He has leg guards but it’s not possible to make out from what they are made. He’s wearing some armour but not the full suit that would have been more common at the time in Western Europe so it’s possible these guards were made of leather. What is possible to see is a design around the ankle area, just before his foot is shown in the stirrups, so giving the impression that aesthetics were also part of battlefield etiquette. His right arm, bare from just below the shoulder, is stretched out in front of him and he is holding a long sword, slightly curved at the end. 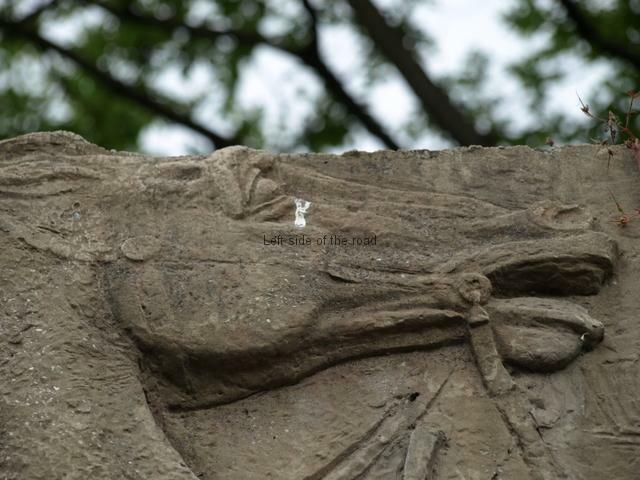 This extends way in front of the horse, Skenderbreu’s hand holding the hilt of the sword close to the horse’s neck. The empty scabbard of this sword is shown hanging from his waist, over the chain mail skirt. His left hand can be seen gripping hold of the bridle between his body and the back of the horse’s neck. Finally, when dealing with Skenderbreu, we have his cape which is doing something it couldn’t, and that’s flying out a long way behind him. The only way this would have been possible in real life was if he was charging at full tilt, but that’s impossible on a horse that is rearing up. Either a full blown charge or an incredibly strong wind, neither of which are possible here. Being a lord Skenderbreu has a real saddle and the rear pummel can be seen at his back. As well as that there are intricate designs on the blanket and a relatively sophisticated stirrup for his feet. In the bottom right hand corner we are shown that Skenderbeu was victorious in this conflict. Here are the discarded weapons, a scimitar, a shield (with the crescent moon symbol of the Ottomans) and a ferrule at the top of the opposition’s standard, now laying in the dirt, no longer fluttering proudly in front of a powerful army. This little collection of trophies is very reminiscent of pictures of another famous warrior fighting against Moslem invaders – Santiago (Matamoros) of Spain. In countless paintings depicting his miraculous intervention in the mythical Battle of Clavijo of 834 (more or less) the battlefield is always littered with discarded symbols of the invaders defeat. 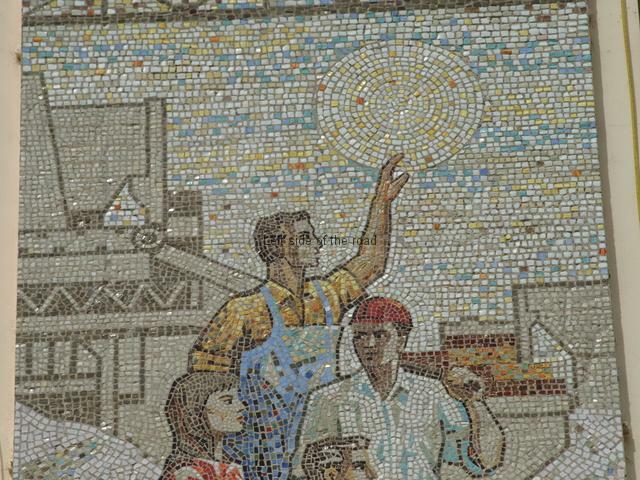 This influence from earlier Christian iconography should neither be considered strange or alien to early Socialist Realist Art. As with ‘Shoket’ in Permet Martyrs’ Cemetery (the work of Odhise Paskali) any and everyone in the early stages of a Socialist society will be carrying with them the influence and baggage of the society that preceded that socialist construction. That will show itself in works of art as well as in language and ways of thinking. It is changing this thinking that is the most difficult task facing Communists after the revolution. 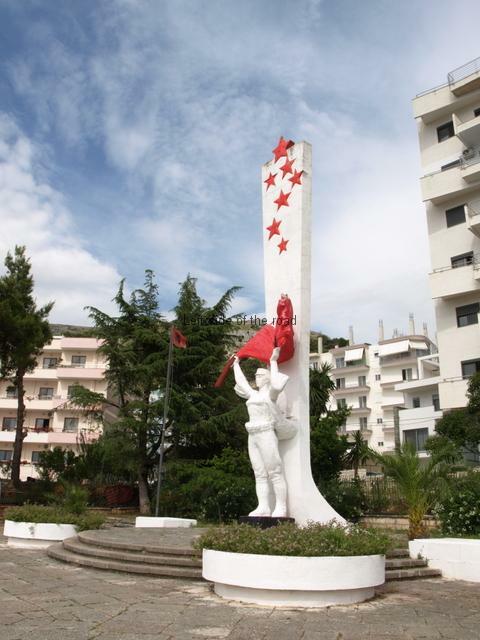 The first soldier behind Skenderbreu and his horse is the standard bearer. He is shown holding the pole of the independence army’s flag. His right hand grips the pole just below the flag (the tensed muscles showing his strength) whilst his left holds it close to his waist. He has the same look of determination on his face as his leader. He also has a bushy moustache but no beard – perhaps that was the private domain of the lords of the land. He is also relatively well protected and armed. He has a chain mail vest that extends to the level of his groin which is over a loose sleeved shirt and a fustanella (the skirt like garment worn by men). Like Skenderbreu he is bare armed. His shins are bare and on his feet he wears the standard shoe and socks of the 15th century. Hanging from his waist, so that it lays against his body horizontally, is a short scimitar style sword. I didn’t think these were common in the Albanian army at the time so perhaps what we are seeing here is a trophy of war. (Soldiers in all wars have done this, picked up something from the enemy if it is considered to be of better quality than what is in their possession.) It’s not clear but he appears to have a long cloak that’s attached to a cape that is on his head, the one piece for protection against the weather. Appearing just before the flag and above Skenderbreu’s flowing cape is the image of a long handled axe, attempting to give the impression that there are more actors in this scene than are actually shown. This is a trick Dule uses on a number of occasions to give a feeling of depth, for example, with the fore hoofs of the horse. The third soldier stands at the left hand edge of the panel. We are definitely moving down the pecking order now. He is heavily armed but poorly protected. He has something on his head but it looks nothing other than a skull cap (and not a traditional cap with which I am familiar). He’s wearing a close fitting t-shirt top and his arms are bare. It’s difficult to see exactly but he also looks to be wearing a fustenella. His left hand is gripping the long pole of a double-headed axe at shoulder height – these battles weren’t overly sophisticated, it seems. They just hacked and thrust at each other with as many pieces of sharp metal they could muster, the winners were the ones who hacked the most – an extremely bloody victory. 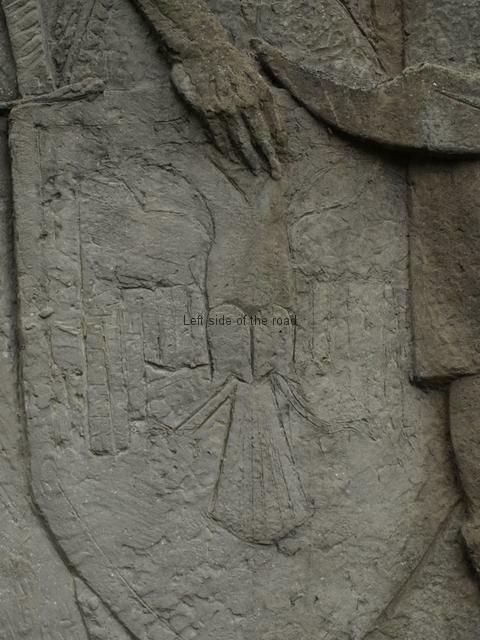 His right hand is holding a large shield, the point of which is resting on the ground, half way along its top edge. 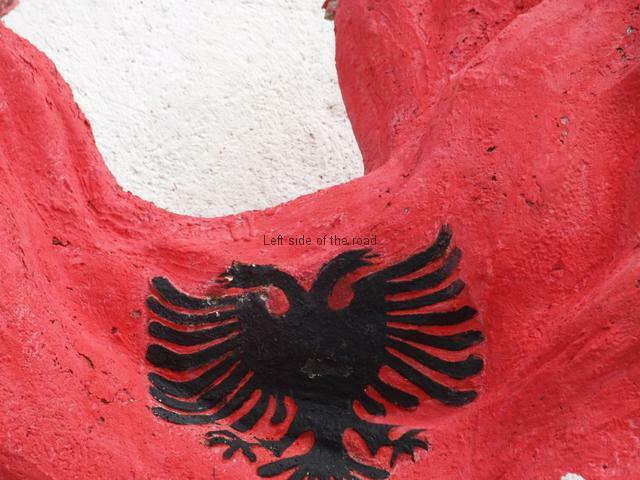 On this shield can be made out the image of the double-headed eagle, the symbol of Skenderbreu, which then became the emblem of Albania when it declared its (short run) independence in 1912 and which became – with the addition of a gold star – the official flag of the People’s Socialist Republic of Albania after 1944. We only see the hilt but there’s a long sword behind the left hand edge of this shield. The face of this soldier is also strange, compared to the other two males shown. It’s back to the style of the horse with it’s frailty and almost a sense of fear. This face is also short of facial hair of any kind. This is the foot soldier who would have been in the thick of battle and who would have suffered the heaviest casualties. I’m not too sure whether Dule is making a statement about these ‘national heroes’. Yes Skenderbreu fought for independence from the Ottoman Turks but he was first and foremost an aristocrat and landowner. 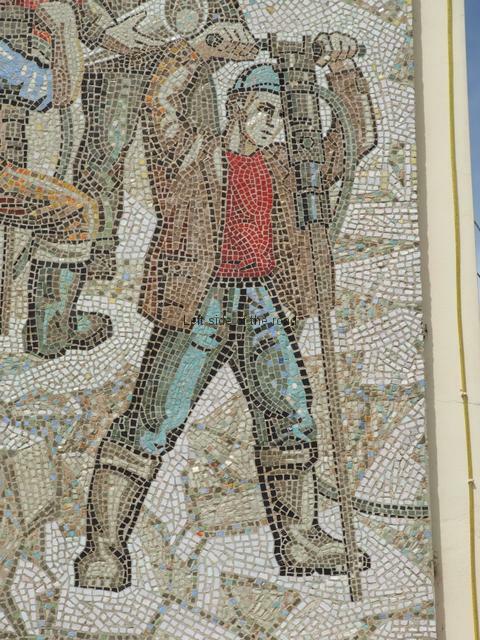 He was fighting for the right to oppress the ordinary Albanian peasant, not for some utopia where all would be equal. Here we have that stratification, that class division, in society shown by the very clothes the fighters in the same army used. Those at the ‘top’ got most protection and that got less as you closer to the foot soldiers, the basis (however ‘great’ the leader or general) of any army, then and since. 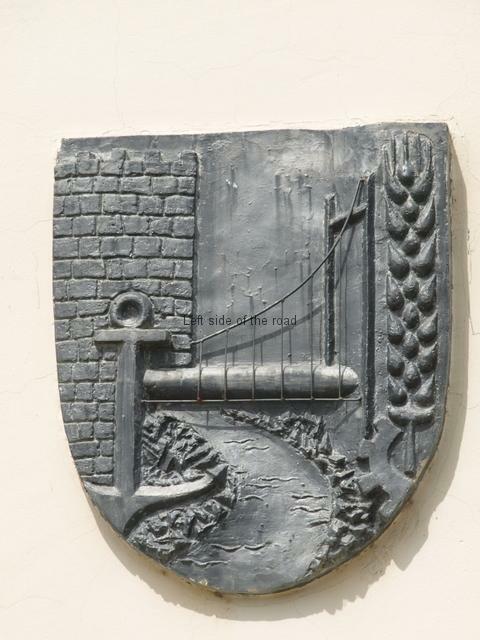 I don’t like this bas relief for the very fact that it ‘celebrates’ the lord who led he fight for national independence but not for the liberation of the people. I also don’t really understand why the myth around Skenderbreu was perpetuated as much as it was during the Socialist period. You don’t have to make such an individual so important just to prove you hadn’t forgotten the past. Individuals from the past are problematic for a Socialist society. In Britain, for example, some see the person of Boudecia as a heroine as she fought against the Romans in AD60. However, they conveniently forget that first she was a collaborator and then, in seeking revenge for wrongs she considered the Romans had committed against her, became a mass murderer and, in modern parlance, a war criminal. If Dule’s approach was as I’ve just suggested then I warm to the sculpture but still don’t consider it one of his best. If that was the underhand manner in which he depicted the ‘national hero’ he should be praised for subverting the common held image. Whilst the panel with Skendebeu and his soldiers is made of concrete the monolith is made of black, local granite. This is more than twice the height of the panel and stands out from the surrounding trees, indicating where the monument can be found. However, with so many lapidars, this monolith provides another enigma, conundrum. At the very top of the column the stones are arranged in such a way as to suggest that there was some sort of slogan, message which could be seen from far off. Now it is impossible to make out what those letters would have been. It doesn’t make sense for there not to have been something there originally. For most of its height the column is completely regular, it’s only at the top that that regularity is broken. I can only assume that this is yet another example of conscious vandalism. As mentioned before the trees in the vicinity of the monument have just been left to grow unhindered and it’s quite possible to pass close by and not know it exists. However, it is the lack of maintenance of the monument itself that serious problems are starting to emerge. 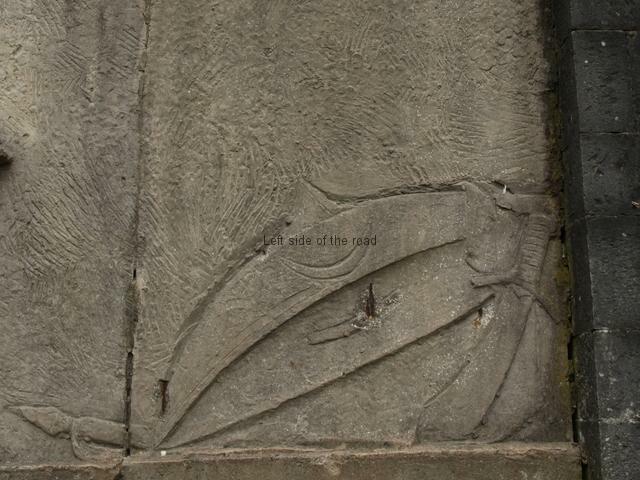 The bas-relief is constructed with iron wires throughout and some places these have been uncovered as the concrete has crumbled. The iron then starts to rust and this must have a knock on effect. 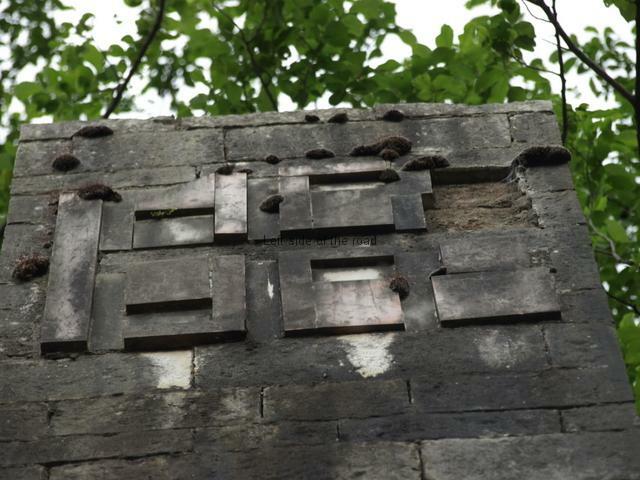 There are a number of places where this is evident, for example, by Skenderbeu’s foot, and a little bit of restoration would prevent the situation from deteriorating and thus causing irrepairable damage. In places the concrete is breaking down to such an extent that you could actually pull pieces off with your fingers. 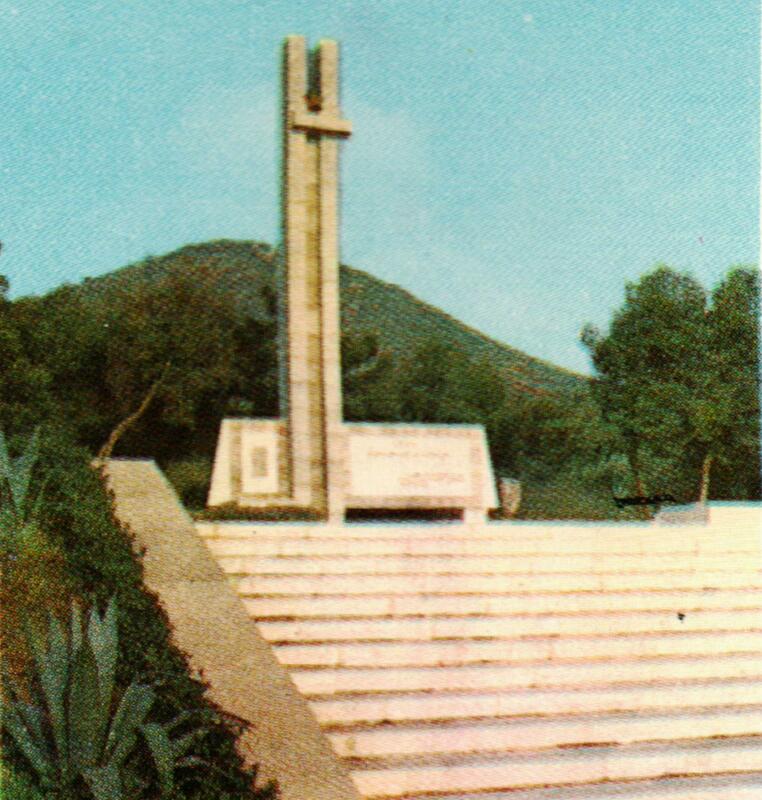 At the same time, considering there’s been little care of the lapidar for 25 years the monument it has survived well – demonstrating that it was well made in the first place. 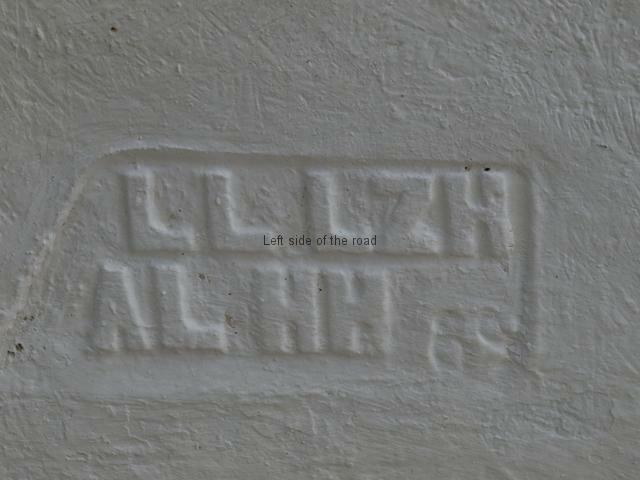 There’s also a place on the sculpture where there seems to have been some deliberate vandalism. The nose and part of the face of the soldier on the extreme left has broken away. This looks like someone has had a lucky hit with a stone and a piece of concrete has broken away. There’s also an indication that Skenderbeu’s nose has been the target for some wag. From Sheshi Çerçiz Topulli go up hill along Rruga Gjin Zenebisi. At the crossroads at the top go left along Rruga Gjin Bue Shpata. As the road goes around to the left take the steps that go up on the right. On arriving at a small cafe take the path to the left, pass the stone tables and seats ‘stolen’ by the cafe and the monument is 20 or so metres away.